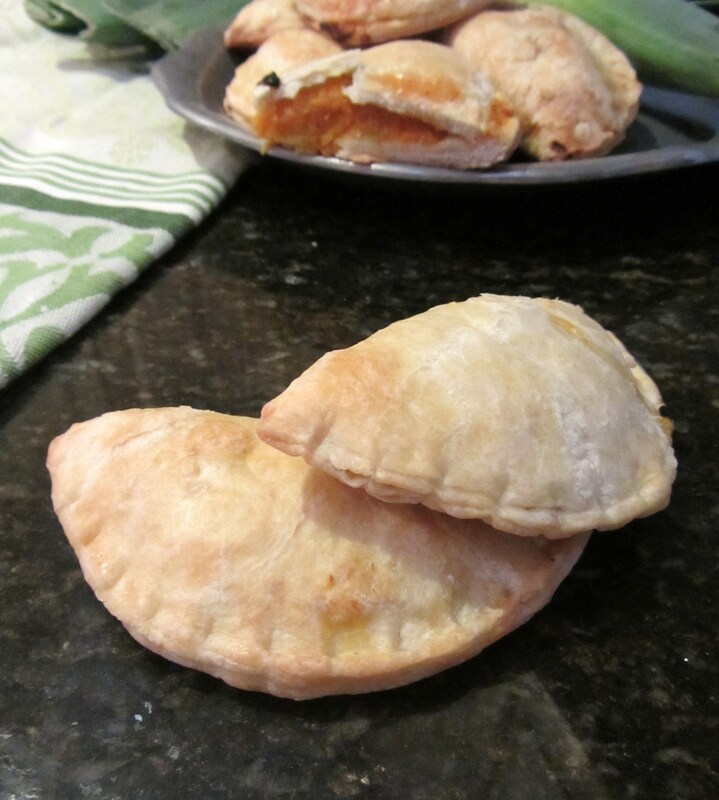 Although not as amazing as the originals upon which they are based (from The Haven, in JP), these tasty hand pies are a wonderful seasonal snack or side. The natural sweetness of the squash and the sauteed leeks compliment one another, and the flaky pastry is a delight. Makes about 15-20 hand pies. Cut the squash in half, scoop out and discard the seeds. Place on a baking sheet and roast in the oven for about 40 minutes at 400F, or until the flesh of the squash is tender. Scoop the soft flesh into a bowl, and mash. Slice the leeks into 1/4″ rounds, working up the white section of the stalks into the pale green. Melt 1 Tbs. butter in a sautee pan and cook the leeks until they are limp and tender. Add to the mashed squash along with the sugar and spices. Mix together the pastry dough: cut the butter and shortening until it’s a crumbly mixture; you don’t want the pieces too small, but neither do you want them larger than a pea. Add the salt and egg yolk, followed by the water, just a bit at a time. Mix until the dough comes together. Roll the dough out to under 1/4″ thickness, and cut into 6-8″ rounds. Spoon a blob of the filling onto the middle of the disc, brush the edges with egg white, and crimp shut, using a fork if necessary. Continue until all the dough is used up. Arrange pies on a baking sheet lined with parchment paper, brush the tops with egg white, and bake at 350F for around 20 minutes, or until the pies are a nice golden color. Remove from oven and allow to cool before enjoying.